What do you think of this MUFFIN TOPS Baking Cups? We've all seen the "muffin top" look before, but not like this. 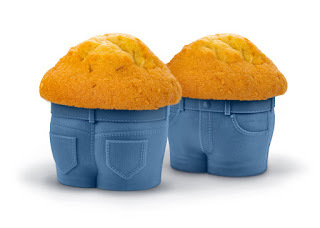 Fill these adorable jean-style cupcake pants with your favorite cake batter. As MUFFIN TOPS bake, they develop that little extra bulge around the middle. Eat up, it's just a little more to love. Usually it's the US Amazon site, but sometimes it IS the Canadian or UK site!